Removes baked - on food. Powerful clean everytime. When washing up with a dishwasher, Finish dishwashing tablets deliver powerful dish and glass cleaning in the toughest conditions. The dishwasher tablets are suitable to be used in most dish washing tasks that involve a dish washer. When washing up with a dishwasher for clean dishes and glasses you can enhance dishwashing by using Finish Dishwasher tablets in conjunction with Finish Dishwasher Rinse Aid and Finish Dishwasher Cleaner. 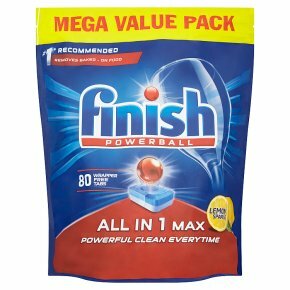 #1* Recommended *Finish is the most recommended detergent, based on the market share of the dishwasher manufacturers that recommend Finish Finish All in 1 Max Tackles whatever you throw at it. Our powerball boosts the tablet to remove even baked-on food, giving you a powerful clean 1st time everytime. Usage: Handle with Dry Hands Only! For best results place one tablet in the dry dispenser. Do not unwrap the tablet. If tablet does not fit, consult the dishwasher manufacturer or manual for advice. For best results in short cycles, place Finish All-in-1 tablet on the floor of your dishwasher next to the filter. Always reseal bag after use. The built-in salt function is effective in soft/med & hard water up to 26°e (21°dH). If your water is very hard, use Finish Salt. For best results use 50 / 55 °C or auto programs. Suitable for septic tanks. This product does not protect from mechanical damage or restore already damaged items. Finish Rinse Aid is recommended for best drying results.